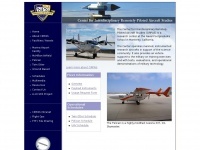 The Center for Interdisciplinary Remotely-Piloted Aircraft Studies (CIRPAS) is a research center located at the Naval Postgraduate School in Monterey, California. CIRPAS.org is specified as the websites creator. The web server with the IP-address 173.164.185.178 used by Cirpas.org is owned by Comcast Business Communications and is located in Berkeley, USA. The website Cirpas.org has a own web server. The web server only runs this website. The websites of Cirpas.org are hosted by a Microsoft-IIS server and were developed in the programming language ASP.NET. The markup language of the website is XHTML 1.0 Transitional. The visitor analysis software Google Analytics is used to analyze the visitors of the websites. Due to the robot information on the webpage, the following actions by webcrawlers are not allowed: using the description of the website from the Open Directory project. All other actions by webcrawlers are allowed.